There is a parking lot alongside of our office building that we welcome you to use. When you arrive at our door, you’ll be greeted with a smile and introductions to our staff. After signing in, we’ll make copies of important documents such as your health insurance card and a list of medications that you are currently taking, and then we’ll assist you in completing some new patient paperwork. Dr. Ioli will review your paperwork and then you’ll have a consultation with him to discuss the problems that brought you into our office. The purpose of your consultation with the doctor is to discuss your health goals and see if chiropractic is likely to help you achieve them. A thorough examination will also help identify the cause of your problem. Patients appreciate that we explain everything in advance! If Dr. Ioli determines that chiropractic can help to correct your problem, you will have your first chiropractic adjustment before you walk out of the door at your first visit! The first visit typically takes about 1 hour, which gives ample time for us to complete your paperwork, Dr. Ioli to give you a thorough examination, and you to experience a chiropractic adjustment! When you return to the front desk, you will be given a written copy of any home care instructions the doctor has prescribed for you. You will also be given two questionnaires to complete at home. This will give the doctor a complete personal and family health history. 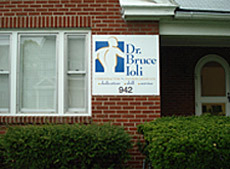 Click here to find out more about your next visit with Dr. Ioli. Please contact our Lebanon practice with questions or to schedule an appointment.